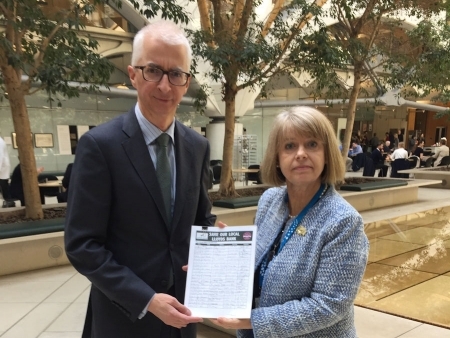 West Worcestershire MP Harriett Baldwin this week met with a Lloyd’s senior director to challenge the bank’s decision to close its branch in Upton-upon-Severn. Harriett met with Benedict Brogan, who is a senior director at the bank and regularly visits the county, to discuss the issues facing Upton people if the branch is closed down. The pair discussed the processes that the bank had gone through to reach this decision and Harriett raised further issues which the bank agreed to look into. Harriett also handed over a petition which has so far been signed by 927 people in just two weeks and the pair agreed to have a further meeting to discuss the outcome of the bank’s fresh assessment. The closure, and the loss of the bank’s 24 hour cashpoint is expected to have a huge negative impact on local people, businesses and the thousands of people who visit the town as tourists or attending one of the many major music festivals. Harriett commented: “The reaction of local people is absolutely clear – they disagree with this decision and I am grateful to everyone who has signed this petition as well as Upton Business Association and local traders, who helped to gather the signatures. “I had a constructive meeting with Lloyd’s Bank and we have aired some of the major issues facing Upton people if the bank does close. Photo: Lloyd’s Bank’s Benedict Brogan receives the Upton petition from Harriett Baldwin MP.